A colour photograph of a brown brick house in the Miniature Village at Cullen Gardens. This building is a replica of a house located at 314 George Street in Cobourg, Ontario. 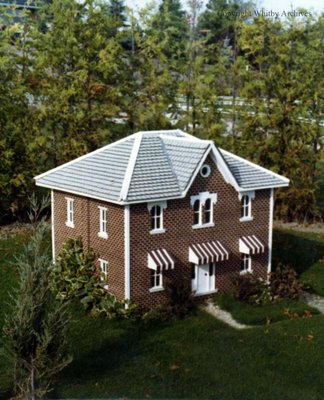 Brown Brick Residence in the Miniature Village, Date Unknown, Photographer Unknown. Whitby Archives A2013_042_189.